Officials on Tuesday voted unanimously to appoint the health director of a prominent psychiatric hospital in New Canaan to a new role serving the town. The Board of Selectmen voted 3-0 to appoint Dr. John Santopietro, president of Silver Hill Hospital, as New Canaan’s first-ever director of behavioral health. Though Santopietro will report directly to the first selectman in the role, “he is definitely going to help a lot of departments, especially the Police Department,” Police Chief Leon Krolikowski told the selectmen at their regular meeting, by way of introducing Santopietro. First Selectman Kevin Moynihan and Selectmen Kit Devereaux and Nick Williams unanimously approved the appointment. In the role, Santopietro will help evaluate and improve New Canaan’s mental health services and policies, guide the police department and work with other municipal agencies, according to a press release issued after the selectmen meeting. There, Santopietro said it was “an honor” to be asked to serve in the role, conceived by Krolikowski. “And so I got interested in psychiatry and finished up my training in about 2000 and actually was sort of ready to save the world one person at a time and then I saw just how broken the system was, really right from the beginning,” Santopietro said at the meeting, held in Town Hall. Santopietro graduated from Yale University, Northwestern University Medical School, and completed his internship, residency, and fellowship at Harvard Medical School, according to a bio in the press release. He is board certified by the American Board of Psychiatry and Neurology and is a Distinguished Fellow of the American Psychiatric Association, and serves on multiple national boards including the American Association of Community Psychiatrists, the National Suicide Prevention Lifeline and the American Hospital Association’s Governing Council of the Section for Psychiatric and Substance Abuse Services. 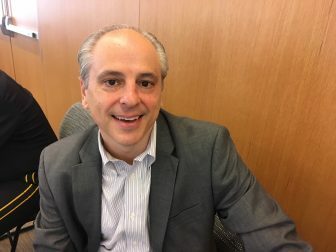 Santopietro also was president of the Connecticut Psychiatric Society in 2012, and earned an award there for his leadership during the Sandy Hook tragedy. Devereaux called Santopietro’s background “incredible” and asked whether and how behavioral health differs from mental health. He answered that they’re largely interchangeable, there’s less stigma associated with the newer term ‘behavioral health,’ which also speaks to “the common pathway” in what professionals do in assessing and addressing problems that may evince themselves through changes in behavior, such as depression. “You can think about it as a new term for ‘mental health,’ a broader term,” the doctor said. Williams asked Santopietro whether he had thoughts on the timely question of police access to video cameras inside New Canaan High School—for example, to address a student that was dealing opioids. Santopietro said a “multi-pronged approach” to the issue of substance abuse is best—including education, support services when people are identified so that they get into treatment early, reducing stigma and understanding that substance abuse use disorder is a brain disorder—and that surveillance itself “is not my bailiwick” and he’d leave that specific question to experts such as Krolikowski and the police. Moynihan said that he spoke on Monday to about 250 fifth-graders at Saxe Middle School, and during a question-and-answer session, one of the kids asked what he was going to do about the drug problem at New Canaan High School. “So it’s on the mind of fifth-graders,” Moynihan said, adding that “it’s a very good time” for Santopietro to start in the essentially pro bono role. “We really appreciate your willingness to participate and help the town,” Moynihan said.